Watch "Jesus—The Son of God." Leslie Basham: When you see one broken family after another, it gets discouraging. It seems like you can find absent fathers or rebellious children everywhere. But Nancy DeMoss Wolgemuth shows us where you can find an example of an ideal family relationship. Nancy DeMoss Wolgemuth: We see the perfect Father/Son relationship between Jesus and His Father. Leslie: This is Revive Our Hearts with Nancy DeMoss Wolgemuth, author of Advent: The First Songs of Christmas, for Thursday, November 8, 2018. Between now and Christmas, we’re getting to know Jesus by studying His names. Today we’ll look at the name, “Son of God.” Here’s Nancy. Nancy: I’ve had the great joy and privilege now of walking with the Lord for over fifty years, and I'm so thankful for these great truths in God’s Word. But you know one of the dangers I’ve experienced over the years, and maybe you have, too, is that these awesome truths from God’s Word, we hear them over and over and over again, and they can become so familiar to us that we lose a sense of the wonder. These familiar truths become commonplace and even, sadly, trivial in some of our lives. That’s one of the things we’re asking God to do in this series on "The Wonder of His Name: 32 Life-Changing Names of Jesus." These are not new names to most of us, but we’re trying to plow deeper into them so that we can be exposed to the wonder of His name and see Him with fresh, loving, adoring, worshiping eyes. One of the most significant, precious promises in God’s Word is one that I think we’ve heard so often that it may have lost the wonder to some of us. It’s that verse in Isaiah chapter 9, verse 6 that says, “For to us a child is born, to us a son is given”—a child is born to us, a Son is given to us. Of course, you know that this is a prophecy of Jesus, the Messiah, 700 years before His birth—a Son is given to us. The Sonship of Jesus is a very important theme in the Scripture. We see through the Scripture several different Sonship titles of Jesus, and each of these titles reveal some different aspect of His person and His work. For example, we reading Mark chapter 6, “Is not this the carpenter, the son of Mary?” This tells us that Jesus was born of a woman. It’s the origin of His humanity—and we’ll talk more about that in some of the upcoming names. And then we read in John chapter 1 and chapter 6 that Jesus is called the Son of Joseph—Joseph who was Jesus’ legal father by adoption. And then we come to Matthew chapter 1, verse 1, and we read this important verse, the first verse of the New Testament, “The book of the genealogy of Jesus Christ, the son of David, the son of Abraham.” The Son of Abraham—that speaks to us about the Jewishness of Jesus. The Son of Mary speaks of His humanity. The Son of Abraham speaks of His Jewishness. Matthew is writing to prove to skeptical Jews that Jesus was indeed the promised Messiah. That Messiah had to be Jewish, and it was important that Jesus followed all the obligations of being Jewish. You’ll find that particularly emphasized in the Gospel of Matthew. Jesus fulfilled all the blessings and the promises made to the Jewish people in the Abrahamic Covenant. For example, in Genesis chapter 22, God promised Abraham “in your offspring shall all the nations of the earth be blessed” (v. 18). Well, who is your offspring, Abraham? Isaac was his offspring. Was God talking about Isaac there? Galatians chapter 3 tells us who that offspring is. It says that offspring is Christ. Christ is the offspring of Abraham through whom all the nations of the earth would be blessed. So it was important that Jesus be in the genealogy of Abraham, the Son of Abraham. Then we see that Jesus, again, back in Matthew 1:1, Jesus is the Son of David—a really important name of Jesus. We could take a whole program on this one. We won’t. But seventeen times in Matthew, Mark, and Luke we see Jesus referred to as the Son of David. The most common expectation of the Messiah was that He would be a descendant of King David. Jesus fulfilled that prophecy. He was indeed the promised Messiah. It was important that the Jews know that Jesus came through the line of David. So we learn in Matthew 1, if you dig into that genealogy, that Jesus was a direct descendant of David through Joseph who was His legal father. And then the genealogy in Luke chapter 3 tells us about Jesus’ lineage through His mother Mary who was descended from David. So He was the Son of David by adoption through Joseph and by blood through Mary—very important if He was going to be the Messiah that people knew that He was a Son of David. That title also speaks of His royalty. He was a descendant of King David, and Jesus was David’s ultimate Son, therefore, the ultimate King. He would fulfill the Davidic covenant, would sit on David’s throne forever and ever—King Jesus. We know that He is because He’s the Son of King David. Now, I want to talk today and tomorrow about two other Sonship titles. Today we want to talk about Jesus as the Son of God, and tomorrow we want to talk about Jesus as the Son of Man. Then there were kings and rulers, particularly King David, who were called “sons of God.” And David was a prophetic type of Jesus, the Son of God. The Son of God was actually an Old Testament Messianic title. All these other “sons of God” pointed to the ultimate Son of God. They were all fulfilled; all these types were fulfilled in Jesus the Son who would reign on David’s messianic throne. So these were “sons of God” in a sense, but He’s called the Son of God forty-seven times in the New Testament. Five times in John’s writings. Depending on the translation you’re using, you may seem Him called the “only begotten Son of God.” What’s the most familiar verse that says that? John 3:16 in the King James it reads that way. 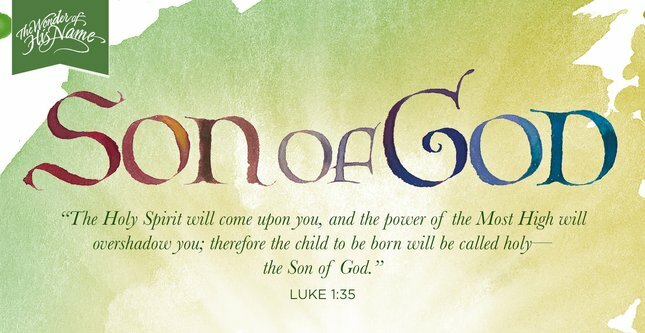 That word means, actually, “unique”—the unique Son of God, the one-of-a-kind, the one and only ultimate Son of God. Now, there are related names. You see Jesus called the Son of the Blessed, the Son of the Father, the Son of the Most High. And then we have Peter’s declaration, “You are the Christ, the Son of the living God” (Matt. 16:16). All names that speak to Jesus being the one and only true Son of God. Now there are a number of different aspects to Jesus being the Son of God that help us know and love Him more. We know that Jesus is the eternal Son of God. Through all eternity past, from before the creation of the world, Jesus shared a Father/Son relationship with God. Jesus is a member of the Trinity. He is co-equal, co-eternal with God the Father and God the Holy Spirit. And we know that as the eternal Son of God, Jesus had an intimate relationship with the Father. Jesus had an intimate relationship with the Father. We read in John 1, verse 1, “In the beginning the Word . . ."—the logos, Jesus—"was with God.” That term “with God” in the Greek conveys a sense of “face to face with God.” It speaks of intimacy. It speaks of nearness. Jesus refers to that intimacy in John 17 when He’s praying, and He’s saying to His Father, “You loved me before the foundation of the earth” (v. 24). There’s a love relationship, an intimacy that Jesus shares with His Father. He’s the eternal Son of God. Behold, you will conceive in your womb and bear a son, and you shall call his name Jesus. He will be great and will be called the Son of the Most High. And the Lord God will give to him the throne of his father David, and he will reign over the house of Jacob forever, and of his kingdom there will be no end (vv. 31–33). Jesus’ virgin birth attests to His being the Son of God. And then His mighty works while He was here on earth, His miracles, they attest to His being indeed the Son of God. He was declared by the Father to be the Son of God at His baptism and again at the transfiguration. “This is My beloved Son,” God said, “with whom I am well pleased” (Matt. 17:5). The demons recognized Him as the Son of the Most High God. You read that in Mark chapter 5, verse 7. Now, as you remember, if you read the gospels, that stirred up no small controversy when Jesus was here on earth because if He wasn’t God, then to say that He was, was blasphemous. But not only did it stir up controversy when Jesus was here on earth that He made Himself equal with God, that He called Himself the Son of God, that has stirred up controversy throughout the history of the church. Let me just mention two instances. Arius was a church leader in Egypt in the fourth century after Christ. He taught that Jesus created the world—which is true—but that Jesus was created by God and therefore was not divine. Thus resulted a major controversy. Then in 325 A.D. the Council of Nicea affirmed that Jesus Christ is not only the Son of God, He is also God the Son. He is not a created being. He has been one with God the Father and God the Holy Spirit for all eternity. Then the Islamic religion denies that Jesus is the Son of God. They believe it is blasphemy to claim that He is because the Muslim religion assumes that means that God had a sexual union with a goddess wife to create Jesus. Now, that is not what is suggested when we call Jesus the Son of God. Christianity does not teach that Jesus is the literal offspring of God produced by any physical act. Christianity does teach that Jesus is the Son of God and God the Son. As the Son of God, Jesus bears all of the divine nature. He has made the fullness of God’s glory known to us. You see that, and we’ll reference this passage a number of times in this series—that magnificent passage in Hebrews chapter 1. I wish we could do a whole series—and maybe some day we will—just on Hebrews chapter 1—the amazing superiority of Jesus. But it starts out by saying, “In these last days, God has spoken to us by his Son . . .”—Jesus. Jesus "is the radiance of the glory of God and the exact imprint"—the duplicate, that word means—"of God’s nature." Jesus shares every attribute of God the Father equally. Now, as I was studying His name, here’s something that really struck me. The eternal, incarnate Son of God, the God who always was, and the God who became flesh (that’s what the word incarnate means) that Son of God was sent to earth by the Father because God loved this world so much. He sent His Son to save us. But that Son who came to earth, sent by the Father, was rejected by those He came to save. There’s a parable Jesus tells in Luke chapter 20 about a man who planted a vineyard, then rented it out to tenants and went away to another country for awhile. When it was time for the vineyard to bear fruit, he wanted the crop, the profits from his vineyard, so he sent a servant to claim the fruit. The tenants beat that servant—in the parable—and sent him back to the owner of the vineyard empty-handed. So the owner sent another servant and then a third, each of whom was treated the same way. Now, Jesus told this parable to the religious leaders of His day to tell them in story fashion exactly what they were guilty of. You see, the Father had sent His beloved Son on a mission to this earth, to claim what was rightfully His. But John 1:11 tells us, “He came to His own, and His own people did not receive Him.” They put the Son of God to death. It's a rebellious world, a prodigal planet. The people that God created said, "We do not want this Man to rule over us." So they put Him to death—the Son of God. But that’s not the end of the story. The Father who had sent His Son, the owner of the vineyard, had the final word. We read in Romans chapter 1 that “Jesus was declared to be the Son of God in power according to the Spirit of holiness by His resurrection from the dead” (v. 4). He didn’t stay dead. He was declared to be the eternal Son of the Father by His resurrection from the dead. Forty days later, the Son of God ascended back to heaven. Today, this same Son of God is exalted in heaven and seated at the right hand of the Father. This is the Son of whom the Father says in Hebrews 1, “Your throne, O God. . ." God calls Jesus God. "Your throne, O God is forever and ever . . . Sit at my right hand until I make your enemies [those people who killed the son of the vineyard—until I make Your enemies] a footstool for your feet” (vv. 8, 13). Who gets the final word? The Father does. The Son does. The enemies don’t. At His resurrection, the Son was given the kingdoms of the world as His inheritance, Psalm 2 tells us. And by His obedient life and His death on the cross for the nations, Jesus won the right to rule over the nations. He won the right to judge and destroy those who rebel against Him. And, thank God, He also won through His obedient life and His death on the cross the right to save those who repent of their sins and believe on Him. And so as we consider Jesus as the Son of God—so what? What’s the takeaway for us? Let me give you two or three of them. First of all, as the holy Son of God, Jesus perfectly loved, honored, and trusted His Father. He obeyed the will of His Father. We see the perfect Father/Son relationship between Jesus and His Father, which raises in my mind this question: Do we honor and love and trust our heavenly Father as Jesus did? Are we obedient to the will of the Father? Jesus showed us what it means to have a relationship with God the Father, what that looks like. It means to love, to honor, to trust, to obey our Heavenly Father. When the Father sent Jesus to the world, Jesus came to the world. When the Father sent Jesus to suffer and sacrifice His life for our sins, Jesus obeyed the will of the Father. What do we do when our Father sends us? What do we do when our Father tells us to go and do this or that? Do we obey Him because we trust Him as Jesus obeyed His Father? Oh, the wonder of it all. The wonder that, through believing in Jesus as the incarnate Son of God, we can have eternal life. We who were guilty of throwing the Son out of the vineyard, putting Him to death, we can have life because He took the death that we deserve for our sins. And so John says in chapter 20 of his gospel, “These things are written so that you may believe that Jesus is the Christ, the Son of God, and that by believing you may have life in his name” (v. 31). And this is the testimony, that God gave us eternal life, and this life is in his Son. Whoever has the Son has life; whoever does not have the Son of God does not have life. I write these things to you who believe in the name of the Son of God that you may know that you have eternal life (vv. 11–13). And then this thought: Jesus has always been the Son of God in His essence, His identity, His nature. He was and is the eternal Son of God. But here’s the amazing thing: by His grace, we may become adopted sons/children of God. We’ll talk more about that in the next session, but remember, John chapter 1 says, “He came to his own, and his own people did not receive him. But to all who did receive him, who believed in his name, he gave the right to become children of God” (vv. 11–12). Leslie: That's Nancy DeMoss Wolgemuth. She’s been helping us catch the wonder that Jesus was the Son of God. She’ll be right back. Today’s message is part of a series called “The Wonder of His Name: 32 Life-Changing Names of Jesus.” Looking at thirty-two different names is not an intellectual exercise. It’s a way for us to get to know Jesus Himself. And nothing matters more than that. If today’s teaching was meaningful to you, I hope you’ll watch a video clip of it and pass on the link to someone else. You can see Nancy teaching today’s message by visiting ReviveOurHearts.com. You’ll find videos like that one and many other resources on our site available to you free of charge thanks to listeners who believe in what the Lord is doing through Revive Our Hearts and support the ministry financially. Would you consider joining them in helping women find freedom, fullness, and fruitfulness in Christ? Your prayers and support for this ministry mean more than you can know. They help us draw the hearts of women everywhere to Christ and help them thrive in Him. This week when you support Revive Our Hearts with a gift of any size, we’ll show our thanks by sending a new 31-day Advent devotional Nancy wrote. It’s called, The First Songs of Christmas. Each day in this book revolves around a single line from one of the songs in the Gospel of Luke. In addition to the brief devotional thought, also included are a few other Bible passages to look up and learn from, and a journaling question to contemplate. Request a copy of the Advent devotional when you donate online at ReviveOurHearts.com, or you can give by phone. The number is 1–800–569–5959. We know Jesus was the Son of God—we heard about that powerfully today. So why did He constantly refer to Himself as the “Son of Man”? Nancy will discuss it tomorrow. Please be back for Revive Our Hearts. As we wrap up today’s session on Jesus as the Son of God, here’s Nancy to pray with us. Nancy: Oh God, how I thank You for the wonder of the Son of God; that You would send Your only, Your beloved Son to this earth to die for us, to live a perfect life, to sacrifice His life for us. We love the Son, and we thank You that the Son loves You, and through Him we’ve learned how to love You and to honor You and to trust You. I pray for a listener right now who has never believed in the name of the Son of God that today would be a day of faith. And for those of us who have believed in the name of the Son of God, may we this day find life by faith in the Son of God who loved us and gave Himself up for us. We pray it in the name of Jesus, amen. Revive Our Hearts with Nancy DeMoss Wolgemuth wants you to know that the Son gave His life for you. The program is an outreach of Life Action Ministries. Dawn Wilson, Lindsay Swartz, and Darla Wilkinson provided helpful research assistance for this series.